There is a video embedded in this post. Please go here to the original post to be able to see it. If you want to follow the blog on email, please fill out the form to the right of this post. Also, please follow me on Facebook or Instagram. It's The Peak OF The Week!! I live in an extremely beautiful area of the country! The main street in my hometown always goes all out with the seasons. 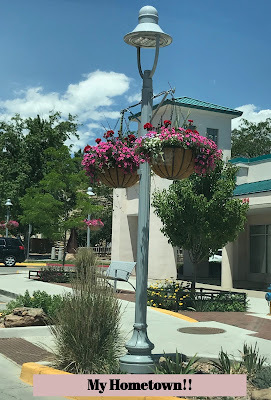 Beautiful flowerpots are all over downtown right now!! 15- Comfort is overrated- live outside your comfort zone. I guess this spoke to me because I have chosen to write this blog. Sharing my life and thoughts has been rewarding, but it is also very scary. I have had to step outside my comfort zone to do it.
" There is no comfort in the growth zone, and there is no growth in the comfort zone." "What people think of you is none of your business." 9- Stop Complaining- No One cares- well, yes, people care to a certain extent. Then you have to pull yourself up by your bootstraps and start moving forward. My daughter and I have talked about this since losing her dad. We realized that although people were wonderful to us, and cared- when it came down to it, people really didn't care after a while. It is just human nature!! 3- Negativity Wastes Life- We all watch how people handle things. I hope and pray that I handle the trials of life with a positive attitude. I have been around way too many people who are negative and it definitely drains the life out of everyone. Dr. Mike has quickly become one of my favorite humans. He is a dementia specialist- I believe he is a physical therapist. He puts a short, inspirational video out almost every day on Facebook. I highly recommend following his Facebook page whether or not you have someone close to you with dementia. I'm leaving you with something that I hope makes you laugh as much as it did me!! Praying Over Food--I have wonderful friends who have never had a meal without a prayer. I have a high respect for them. I admit, praying before an everyday meal is just not something that we did in our home. I guess the kids were always so busy. And, to be really honest, I just never really got the "why" of it all. I guess that's why I found this video to be so funny!!! For me, the bottom line is- pray with your kids and let them know that you pray for them. I don't care when it is!!! Happy Peak of the Week!!! It's all downhill from here!